Shelly here from 100Things2Do.ca. I’m commandeering Sherri’s blog page for the next 6 weeks to show you how we are making over her basement office into a rustic-industrial workspace. The bi-annual One Room Challenge (with media partner Better Homes and Gardens) is underway! For this challenge I bullied asked my friend Sherri if she would be willing to sacrifice her basement office to the DIY and design challenge and she said yes! I’m not sure why she thought this room needed a makeover? The cabinets under the desk on your right are built-in and I believe have been there since Sherri moved in years ago – which made furniture placement a bit limited. 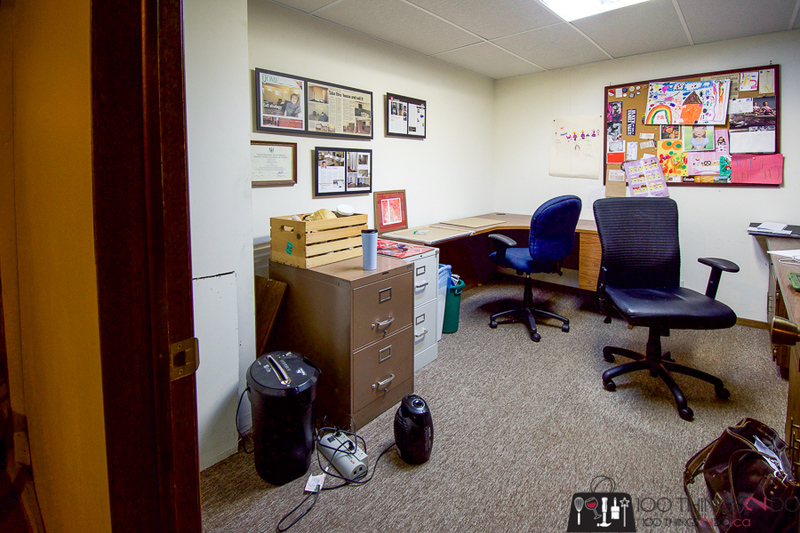 The room itself is approximately 12′ x 12′, so a fair size for a home office – if you could bring yourself to work in here. As you can see, right now the basement office is on a “must use” basis – versus a “want to use” space. We are hoping that over the next 6 weeks the transformation will be almost unrecognizable and the space will become one of the favourites in the house. I will admit to having a secret weapon in this ORC – Sherri is a contractor and owner of Details Renovations! I’m going to do as much work as I can, but I do have the added bonus of working with a professional that knows what they are doing, so I also benefit from the DIY learning as we tackle each step. And they’re off ladies and gentlemen! Come back next Wednesday (or subscribe to the blog so you don’t miss anything) and see how far we’ve come in the first week. Did I mention I’m SO EXCITED?! Thank you Sherri for being such a good sport!